Scheda: Nazione: Cina-Hong Kong - Produzione: Bill Kong, Beijing New Picture Film, Elite Group Enterprises - Distribuzione: Miramax Films, Eagle Pictures, Warner Bros., Moonlight Films, United International Pictures, Alliance Atlantis Communications, Beijing New Picture, Buena Vista International, Columbia TriStar, Rialto Film, Universal Pictures - Soggetto: Li Feng, Wang Bing, Zhang Yimou - Sceneggiatura: Li Feng, Wang Bing, Zhang Yimou - Fotografia: Christopher Doyle, Hou Yong - Montaggio: Angie Lam, Ru Zhai, Vincent Lee - Scenografia: Tingxiao Huo, Zhenzhou Yi - Costumi: Emi Wada - Musiche: Tan Dun - Effetti speciali: Animal Logic, The Orphanage, Tweak Films - Formato: Color, B.N. - Durata: 96' (107'). 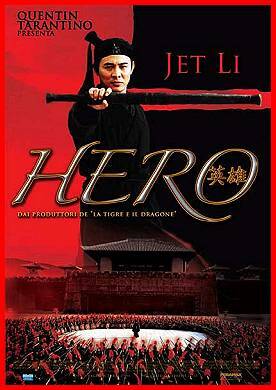 Cast: Jet Li, Tony Leung Chiu Wai, Maggie Cheung, Zhang Ziyi, Daoming Chen, Donnie Yen, Liu Zhong Yuan, Zheng Tia Yong, Yan Qin, Chang Xiao Yang, Zhang Ya Kun. 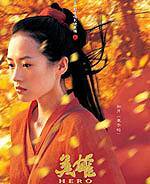 Trama e commenti: cinematografo.it - kataweb.it - mymovies.it - film.spettacolo.virgilio.it - cinema.castlerock.it - cinefile.biz: «Zhang Yimou rielabora la più classica ambientazione dell'epos cinese, portandoci al III secolo a.C. La Cina è divisa in sette regni in lotta fra loro per il predominio, gli "Stati combattenti". Il Re di Qin sta per prendere il sopravvento e riuscire nel suo intento di dominazione assoluta, ma deve fronteggiare il continuo pericolo di attentati da parte dei suoi nemici. È per questo che riceve a palazzo un misterioso guerriero che si fa vanto di aver sconfitto i più agguerriti attentatori alla vita del Re. Il principale piano temporale del film è quello che vede il confronto tra il Re e lo Straniero. Nel rievocare lo scontro con gli altri combattenti, i due si sfidano nello scoprire diversi livelli di verità, disposti su vari flashback, che vanno a comporre la successione narrativa del film. È evidente il richiamo al Rashomon di Kurosawa...». Plot Summary, Synopsis, Review: IMDb - entertainment.msn.com - buch.de - rottentomatoes.com: «Using the assasination attempt of the historical figure, Chin Shi Huang Di (The first emperor of China) as a backdrop, this film attempts to explore and develop a better understanding of the Chinese concept of a hero. 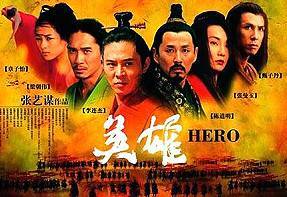 In a Chinese cultural context, it hopes to explore the preconceptions and misinterpretations of heroism and heroes. At the height of China's Warring States period, the country was divided into seven kingdoms: Qin, Zhao, Han Wei, Yan, Chu and Qi. For years, the separate kingdoms fought ruthlessly for supremacy. As a result, the populace endured decades of death and suffering. The Kingdom of Qin was the most determined of all. The Qin King was obsessed with conquering all of China and becoming her first Emperor. He had long been the target of assassins throughout the other six states. Of all the would-be killers, none inspired as much fear as the three legendary assassins, Broken Sword, Flying Snow and Sky. To anyone who defeated the three assassins, the King of Qin promised great power, mountains of gold and a private audience with the King himself. But...».